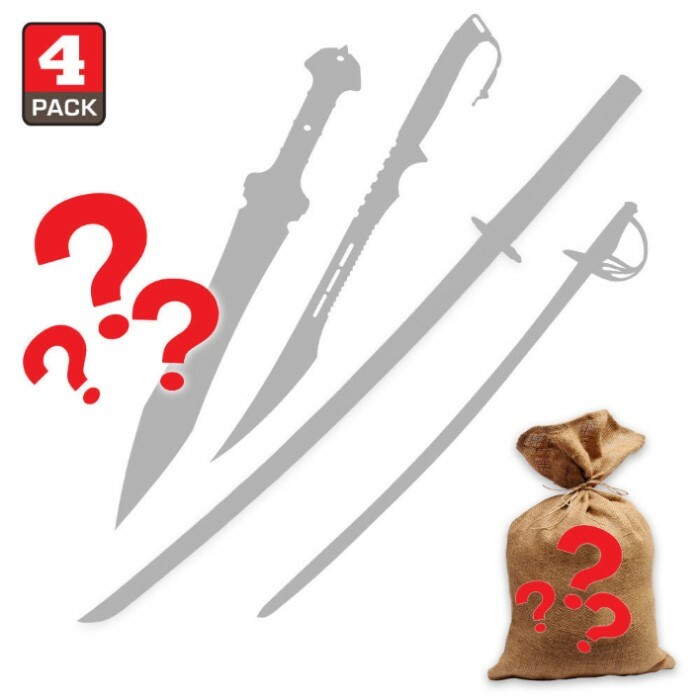 Swords Scratch & Dent Sale Mystery Bag Four Pieces | BUDK.com - Knives & Swords At The Lowest Prices! We've got another great savings opportunity for you with this scratch and dent Sword Sale mystery bag! For less than $40, you'll receive a combination of four swords in this mystery set. We've found a stash of scratch & dent pieces that are still in full working order, and we're passing along this opportunity for incredible savings to you. 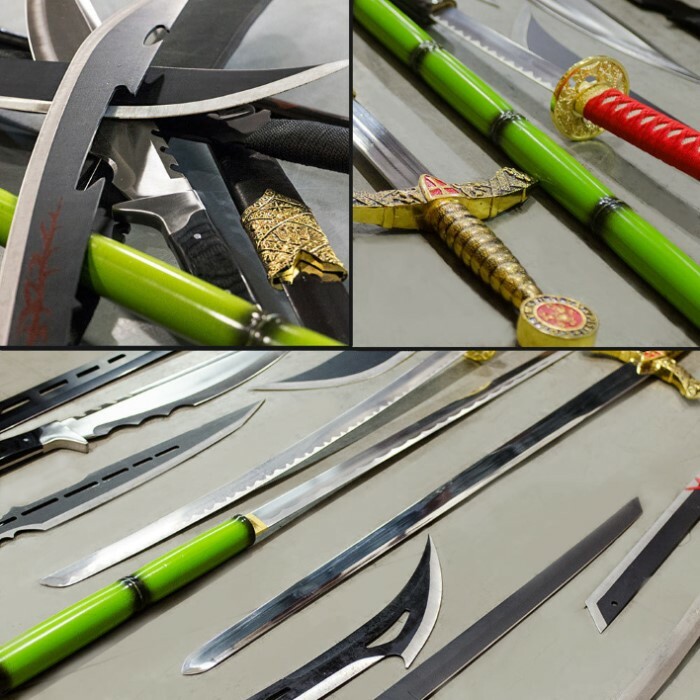 Enjoy four stylish swords for less than $10 apiece! It'll be just like opening a present when your mystery bag arrives! Note: these items have minor defects, blemishes, missing sheaths, etc. I received my 3rd box now i have ordered from Budk and it was definitely worth the cost on $49,99 I was just hoping to get some thing finally i might be excited over but my adult sons like it cause they get to reap the benefits of the other stuff i toss them ha ha. I got 1 fantasy Samurai sword dull no edge, 1 fantasy cut out sword with two small cut out throwing daggers all cord wrapped, 1 cut out red stripped fantasy sword cord handle wrapped and a cheap replica dual sword set of Gladiator Swords. It was worth the price but remember guys its just luck of the draw i guess. I am yet to get anything special in 3 boxes to me. I received my box, first thing i noticed was it had been partially opened on the lid ends because it was re taped with package tape., nothing missing. I received a Nier: Automata Virtuous Contract Sword, Gladiator Warrior Twin Sword Set with Double Shoulder Sheath,Blue Ninja Samurai Machete Sword And Kunai Set, some sort of red cord wrapped handle Steampunk Sword And Sheath. It was worth the price sure, my adult sons who are into that fantasy stuff liked them because i tossed it all to them. Maybe next time i will get lucky and get a set i enjoy, this is my 3rd box. Its just luck of the draw guys remember that. Had an issue with the first purchase of this item but it had nothing to do with BUDK. It was a post office issue. Some quality employee at the post office decided to open the package prior to delivery and help themselves to one of the swords. That said I contacted BUDK’s service department sent an email showing what happened and they sent a report to their claims department and will be sending a replacement. Just purchased a second one this time it’s going to be delivered via FedEx so it should be delivered intact. I have been buying these and unboxing them in YouTube videos for over a year now and I have yet to be disappointed. No, you aren’t going to get a $2000.00 sword, but I Always get a lot more than my money’s worth. They are a ton of fun to unbox and share with my viewers. Vroom Box is the channel name and if you want to see what I get as I get it look me up on YouTube and we’ll enjoy them together. First item was a Honshu sword with only a cracked scabbard (blade was perfect). A little black leather wrap with stitching and is now a highlight of my collection. A sword cane with a lose marble in the dragons mouth (super glue to the rescue). A black blade decoration katana with no cosmetic blemishes I could find (some packaging damage). And a decoration katana with a lose scabbard tip (again - super glue to the rescue). What a deal! Not only exceptional daily deals but now a mystery package that exceeded every expectation. BudK delivers again and again! I buy these and unbox them for YouTube videos. I’ve bought several and I have yet to be disappointed. No, you aren’t going to get a $2000.00 sword but, I Always get a lot more than my money’s worth. They are a ton of fun to unbox and share with my viewers. YaDick Vroom is the name and if you want to see what I get as I get it look me up on YouTube and we’ll enjoy them together.